Are you looking at a Chinese restaurant menu with no idea what you're about to eat? It used to take a lot of skill to lookup a character in a dictionary. 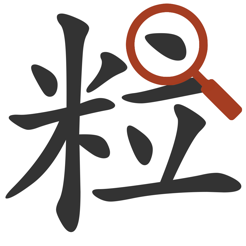 With this app however, you can identify up to a thousand characters in no time! You don't have to learn anything*. 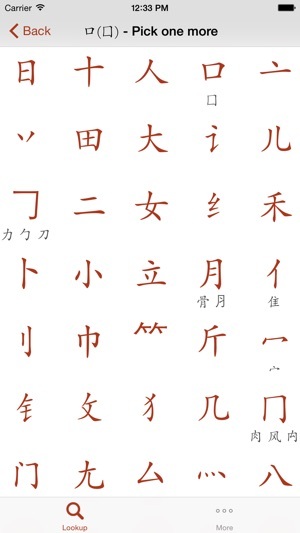 Each Chinese character consist of several elementary shapes, called radicals. Official dictionaries only make use of one radical per character, but this app looks at all of them. 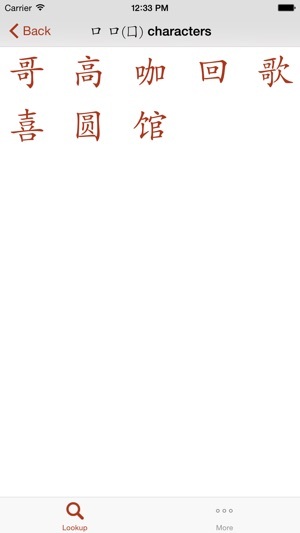 To find a character like 肥 tap on the first radical that you recognize: 月. 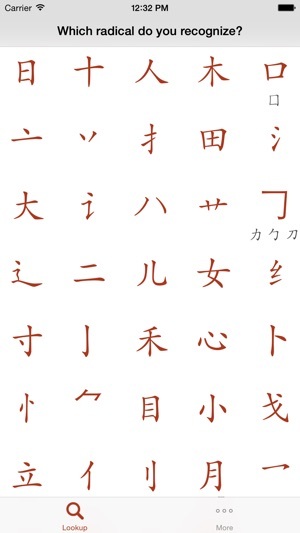 You'll then see another list of radicals where you need to tap on 巳. That takes you to a short list of matching characters. 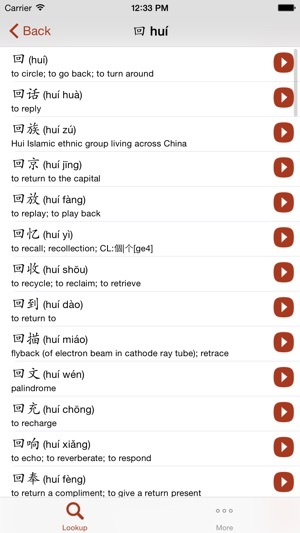 For each character the app contains up to 100 words and phrases together with English translation and Chinese pronunciation. Everything including the pronunciations works offline. The free version comes with a practice PDF so you can learn how to use this new method. It has a limited number of characters. Upgrading within the app gives you access to over a thousand characters. I'm working hard to add more. There are tens of thousands of Chinese characters, but it only takes a few thousand to achieve literacy. The about section of the app shows a list of all the sources I used, the most important of which are wiktionary.org and CEDICT. The app gathers anonymous usage information which helps me to improve the app. * = Actually, the app will be even easier to use if you take the time to memorize 50-100 of the most important radicals. A link to a free PDF poster is included in the app. Support for iOs 8, iPhone 6(+) and iPad. I'm the developer of this app and I use it myself. I was watching a documentary recently and noticed some characters in the backgrouns. I then learned that they mean "fire extinguisher".